Email Threats are Real. Securence® is a Real Solution. The Imperfect Storm: Amazon vs. NYC, Howard Schultz vs. Trump, Snowmaggedon! 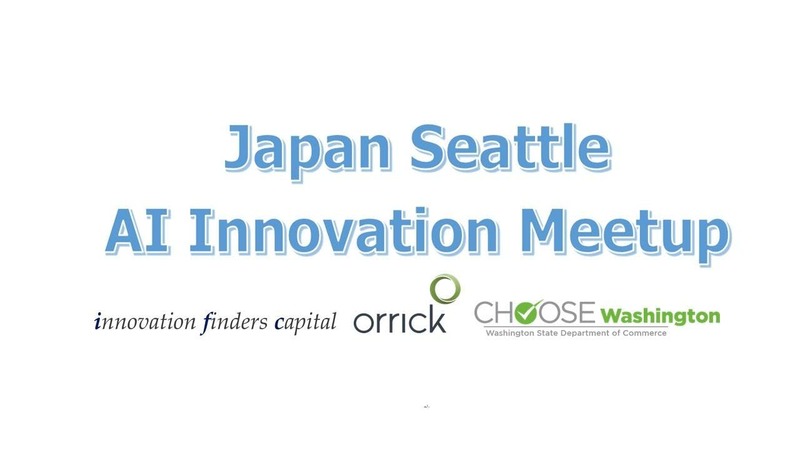 Innovation Finders Capital (IFC), the Washington State Department of Commerce, and Orrick Herrington & Sutcliffe invite you to attend the Japan-Seattle AI Innovation Meetup 12.0 and Seattle Innovation Investors Track 3.0. This is a double feature event that should result in your meeting with delegations, one-on-one on the following day. Some of the largest VC funds andinvestors from Canada will come to Seattle to pitch to the innovators community on what kind of technology they are looking for and how they would like to invest in your startups. Then during the networking session, you will get to meet them and if they are interested, they may request for one-on-one meeting on the following day. The pitch session will be preceded by Orrick’s seminar on financing by legal experts on raising money form VCs. Startups seeking alternative method of financing through Canadian TSX-Venture should definately attend and meet with investment banks and sevice providers who can help to raise your financing. Many of the largest Japanese companies will be pitching to the Seattle innoavtors, what kind of innovation they are looking for and how they would like to do business with you. So if you are looking for serious revenue opportunity, just come to downtown Seattle to hear them out and meet them for the networking session. If they like to meet you, we will make sure that you get to sit down with them for one-on-one on the following day. Also, Japanese delegation are looking for development service providers as well as tools and development utilities companies as well. And we do have companies from ICT, Chemical, Manufacturing, Trading & Finance and many others coming, even if you are doing innovative composite materials to bit coin startups, do give it a go. 3. Come to the Meetup event. The Japanese companies will pitch to you, what kind of Innovations they are looking for and how they would like to do business with you. 4. Meet them during the networking session after the Meetup and ask if they would like to meet you on the following day. 6. Come prepared for the one-on-one meeting. If you can give a demo, that will be great. This Eventbrite registration is for Pitch + Networking session on April 18 and the one on one on the following day. Both are FREE but I recommend you prepare well in advance. Again, I cannot stress enough that this is investment and revenue opportunity. When you register, please make sure to fill in what kind of technology/product/service you offer and your URL. Venture Capitalists from Europe and Japan will reverse pitch to the Seattle Startup community. Major corporations from Japan will pitch to Seattle Startup community for business development and distribution deals. 4. What are the market opportunities? Participants for the Meetup will have a chance to meet them at the networking session or the pitch session and ask for one-on-one. We also pre-arrange one-on-one so please register your interest to participate, and we will send your names and URL to the delegations. We will inform you of the early one-on-one selection a week before and final schedule after the networking session. One-on-one session is 30 min sessions. In the previous event, we organized 198 sessions. Please contact organizer using this web site for more information. Welcome to Seattle24x7, the first-ever Puget Sound online business community and the one-and-only, dot-com combination of Company Directory, Community and Commentary. © Seattle 24×7 1999-2018. All rights reserved.